In a climate where many unsubstantiated claims are made, it is essential to have access to the best evidence-based knowledge on how to extend healthy life expectancy. 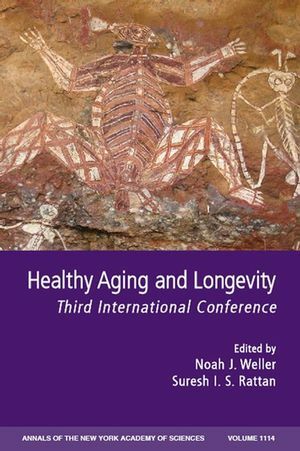 Researchers, healthcare practitioners, and policy makers come together annually at the International Research Center for Healthy Ageing and Longevity to discuss, debate, and exchange ideas, and the proceedings of the most recent conference is contained in the chapters of this volume. Noah J. Weller and Suresh I. S. Rattan are the authors of Healthy Aging and Longevity: Third International Conference, Volume 1114, published by Wiley. 5. Transcriptional Regulation of Telomerase Activity: Roles of the Ets Transcription Factor Family: Julie Dwyer, He Li, Dakang Xu, and Jun-Ping Liu. 6. Potential Roles for Estrogen Regulation of Telomerase Activity in Aging: Sharyn Bayne, Margaret E. E. Jones, He Li and Jun-Ping Liu. 7. Mechanisms of Action of TGFb in Cancer: Evidence for Smad3 as a Repressor of the hTERT Gene: He Li and Jun-Ping Liu. 8. Evidence That Autophagy Is Involved in Aging and Is an Essential Part in the Anti-aging Mechanism of Caloric Restriction: Ettore Bergamini, Gabriella Cavallini, Alessio Donati and Zina Gori. 9. Age-related Changes in the Liver Sinusoidal Endothelium Are a Mechanism for Dyslipidemia: David G. Le Couteur, Victoria C. Cogger, Robert S. McCuskey, Rafael de Cabo, Bård Smedsrød, Karen K Sorensen, Alessandra Warren, Robin Fraser. 14. Patients with Dementia and Their Carers: Charles Bridges-Webb, Belinda Giles, Catherine Speechly, Yvonne Zurynski, Navaz Hiramanek. 16. Debating the Influence of Self-reports by People Living with Chronic Disease on Healthy Aging and Longevity: Kay Price. 20. Age-related Changes in Strength and Somato-sensation during Mid-life Support Rationale for Targeted Preventive Intervention Programs: Nancy L Low Choy, Sandra G Brauer, Jennifer C Nitz. 23. Anti-Aging Medicine and the Cultural Context of Aging in Australia : Beatriz Cardona. Part III : Socio-cultural Perspective:. 26. Grey Nomads' in Australia: Are They a Good Model for Successful Aging and Health: Paul F. D. Higgs, Frances Quirk. 31. Тhe Еlderly in a Period of Transition: Health, Personality and Social Aspects of Adaptation: Ignat C. Petrov. 38. Involving Service Users and their Carers as Equal Partners on a Project Using Electronic Communication: Susan M Ashby, Sian E Maslin-Prothero, Amelia C Rout. 39. Nutritional Interventions in Aging and Age-associated Diseases : George S. Roth, Donald K. Ingram, James A. Joseph. 41. Dietary Polyunsaturated Fatty Acids and Age-related Membrane Changes in the Heart: Salvatore Pepe. 47. Caloric Restriction, the Traditional Okinawan Diet and Healthy Aging: The Diet of the World's Longest-Lived People and Its Potential Impact on Morbidity and Lifespan: Bradley J. Willcox, D. Craig Willcox, Hidemi Todoriki, Akira Fujiyoshi, Katsuhiko Yano, Qimei He, J. David Curb, Makoto Suzuki.